Pre-orders for the brand new PC cushion of virtual idol Hatsune Miku opened yesterday on June 15th, 2016 at 11am. The cushion is being released from Bandai’s official website from the “Premium Bandai” section. 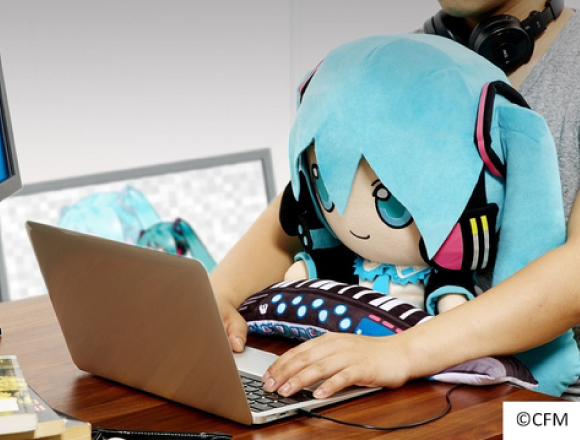 The cushion comes as a stuffed toy of everyone’s favourite virtual singer, Hatsune Miku. This new item serves as both a cushion and an arm rest, and is perfect for those days at home or in the office where you must work long hours on the PC. The details on this soft Hatsune Miku plush really bring the virtual idol to life, with her headphones and head mic readied and her arm covers in place. The armrest part of the cushion is even designed as a blue Hatsune Miku-style keyboard. She is just the right firmness and softness for you to have her support you by being both on your desk and sitting on your lap at the same time, which will make for a comfortable session of PC work, and if you rest your arms on top of the arm rest, they will become less tired during those long hours.